1. Introduction to Silicate Glass Technology. Glass and Antiquity. The Glassy or Vitreous State. Glass Formers and Glass Compositions. The Manufacture of Silicate-Based Glasses. Forming and Finishing Operations. Thermal Processing and Properties of Silicate Glasses. Inherent Properties of Glass. Silicate Glass Products Currently being Manufactured. 2. Introduction to Polymeric Glasses. Prior Attempts to Prepare Stable Phosphate Glasses. Structural Units in Glass. Basis for Chain Structure of Polymerized Phosphates. Prior Attempts to Prepare Phosphate Glasses by the Melting of Stoichiometric Compounds. Crystalline Salt Monomers for Stable Phosphate Glass Preparation. 3. Factors Contributing to the Preparation of Stable Phosphate Glasses. Anomalous Recrystallization of Polymeric Calcium Phosphate Glass. Abnormal Strain Relief Behavior of Polymeric [Ca(PO3)2]n Glass. The Effect of Melt Hold Time on Glass Points. Measurement of Hydrolysis Stability of Polymerized Glasses. Effects of Purity and Melt Hold Time on Hydrolysis Stability of Polymerized Glasses. Effect of Melt Hold Time on Melt Viscosity. Effect of Excess H3PO4 on the Reaction Paths of Monobasic Salts. Effect of Ca/P Ratios on Stability of Polymerized Glass Compositions. Other Polymerized Alkaline Earth Phosphate Glasses. Effect of Crucibles Used to Hold the Melt during Polymerization. The Combined Effects of Purity and MHT upon Polymerization. 4. Further Aspects of Polymerized Phosphate Glasses. The Impurity Phase-Segregation Phenomenon. Phase Separation as a Function of M in [CaM(PO3)2]n Glass. Physical Properties of Fully Polymerized Phosphate Glasses. Elimination of Striae and Other Optical Defects. Spectral Properties and Ultraviolet Transparency. Internal Diffusion Mechanisms and Modes of Chemical Attack. Optimal Methods of Purification. Other Inorganic Polymeric Glasses. 5. Uses of Polymeric Phosphate Glasses. Nuclear Waste Sources. History of Glass as a Nuclear Waste Encapsulent. Polymeric Phosphate Glass and Nuclear Waste Encapsulation. Properties of a Polymeric Phosphate Glass Containing Nuclear Waste. Luminescent Polymeric Phosphate Glass and its Applications. Other Potential Uses of Polymeric Glass. Subject Index. The author describes a novel method of preparing hydrolysis-stable non-silicate glasses which is based on experimental work accomplished over the past twenty years. As such, the method is the beginning of a new approach to glass-making by the use of a molecularly-polymerizable precursor. 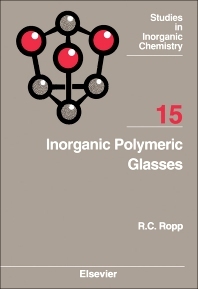 The book elucidates the technical details required to produce such molecularly-polymerized glasses from carefully prepared inorganic molecular monomers. Essentially, only silicate-based glasses have been known to be stable, whereas non-silicate glasses could not be attributed with such properties. Such glasses have, therefore, not found widespread usage in industry. The new phosphate glasses described here exhibit stabilities superior to many of the silicate glasses. For example, the nuclear-waste glass shows no measurable loss at all in boiling water, something entirely foreign to the zinc borosilicate glasses developed for nuclear waste encapsulation in the U.S. by Battelle-Northwest. The exceptional stability of the new glasses is achieved by selecting an inorganic compound capable of being polymerized, and then causing it to polymerize in a proper manner, in the absence of chain-stoppers. To obtain glasses equal or superior in hydrolysis stability to silicate-based systems it is imperative to employ molecular polymerization in situ, starting from carefully prepared precursors of exact stoichiometric proportion. Researchers in glass and glass properties will find this volume extremely useful and those involved in organic polymers will be intrigued by the similarities and disparities of the two systems. Richard C. Ropp, Ph.D., holds a Ph.D. in Physical Chemistry from Rutgers University (1971), an M.S. from Purdue University (1952), and the A.B. (Chem.) from Franklin College (IN). His career in chemistry spans over 60 years and he has been a consultant to industry during the past 40 years. Dr. Ropp has presented many seminars and talks and is the author of eight books (six by Elsevier). These books are based upon the properties of alkaline earth compounds. He began working with alkaline earth compounds in 1952, and was the originator and inventor of the red color TV phosphor in 1956 which is still being used today. He also created more than 25 new lamp and TV phosphors still being manufactured for the industry. Most of these were based upon alkaline earth compounds. He also developed more than 15 new chemical processes for raw materials used in the trade, many of which involved the manufacture of alkaline earth compounds. Fifty-five patents have been issued in his name (seven on glass) and he has published 63 technical papers. About 90% of the patents involved alkaline earth compounds. He is the inventor of a new type of alkaline earth phosphate glasses based on molecular polymerization. These glasses do not exhibit surface leaching by water and are more stable to hydrolysis than silicate-based glasses. These new glasses have unique applications in fiber-optics, high level nuclear waste disposal, high strength fibers, medical and dental implants, lasers, projection TV, and uses in optical and electronic components. Dr. Ropp held appointments as Research Specialist and Member of the Faculty of the Department of Chemistry at Rutgers University in Newark, NJ from 1971 to 1981. His experience has been varied and he has acted as Consultant and Expert Witness to attorneys concerning the technological aspects of their ongoing cases from 1989 to 2011 (more than 155 cases). From January 1990 to January 17, 1991, he served as Vice President of Technology for International Superconductor Corporation (ISC) of North Miami Beach, FL. During that time, he was responsible for all matters pertaining to technology and acquisition of patents in the field of high temperature ceramic superconductors. Due in part to his efforts, ISC now owns 16 patents for license or sale to the industry. He continued to aid in the marketing campaign and became a member of the Licensing Executives Society in September 1990. From May to December 1989, he served as Consultant to the Corporation and wrote all 32 patent applications subsequently filed in the US Patent Office. From April 1988 to April 1989, he served as Director of Technical Affairs at Electro-Nucleonics in Fairfield, NJ (later called CPG, Inc.) where he was responsible for Quality Control during the manufacture of controlled pore glass, including the preparation of various types and grades of coated glass. Part of the work included improvement of existing manufacturing techniques, as well as new techniques for producing coated glass. Dr. Ropp's other affiliations include: Staff Scientist for Allied Chemical (Morristown, NJ- 1973-1977); Westinghouse Electric as Manager of Special Products Group (Bloomfield, NJ- 1963-1967) and as Consultant (1967-1970); and Advanced Development Engineer for Sylvania Electric Products (Towanda, PA- 1952-1963). He was consultant to ITT (1973) for evaluation of their lamp manufacturing plant, production methods, and quality control at Champion Lamp Works in Salem, MA. He was invited in May 1996 to lecture for two days at ITRI (Hinchu, Taiwan) on phosphor properties. A New York City insurance company sent him to Taiwan to evaluate 4000+ cathode-ray tubes, said to be water-damaged (December1996). He also served as consultant from 1995 to 2003) to Light Sources of Orange, CT during their development and manufacture of superior “Blacklight” fluorescent lamps for tanning salon usage. Dr. Ropp is a Fellow of the Royal Society of Chemistry (London) and is a Chartered Chemist of the Society. He is also a member of the American Ceramic Society, American Chemical Society, AAAS, Materials Research Society, Sigma Xi, Licensing Executives Society, and served as the President of the New Jersey Institute of Chemists (1976-1980). He is listed in Who's Who in the East and Who's Who in the World-Registry of Business Leaders.